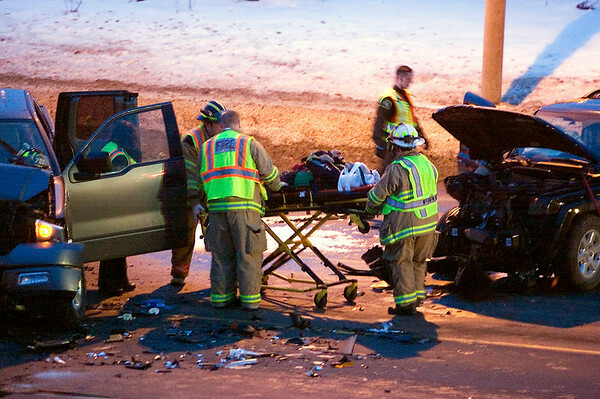 Firefighters take the driver of a full-size pickup truck to an ambulance after a collision on U.S. 31 Friday. Four vehicles were involved in two seperate collisions near each other on U.S. 31 just south of Fitzhugh Drive on Friday around 5:30 p.m. At least two people were taken away by ambulances. A Jeep Liberty and a full-size pickup collided near Fitzhugh Drive, while a minivan and station wagon collided roughly 25 yards to the south. Both wrecks blocked the northbound lanes of U.S. 31, but traffic was backed up in both directions.